From small craft boatbuilding to World War Convoys, the Days of Sail to the Age of Steam, the Titanic to the Halifax Explosion, you’ll discover the stories, events and people that have come to define this province and its relationship with the sea. Turn along the treed roadway at Uniacke Estate Museum Park and feel like you’re traveling a direct route to the 1800s! Arrive at an elegant home overlooking Lake Martha, once known as a prominent place on one of only two “great roads” in Nova Scotia. Here, Richard John Uniacke, a prosperous Irish politician, built his country mansion in 1816. One of the grandest houses in Nova Scotia, it became a favorite home for seven generations of his large family. Inside, find a rare survival of one family’s treasured possessions. See fine, labeled London furniture and exquisite portraits at home in this house for hundreds of years. Outside, explore the English country landscape, do some birdwatching and stroll or hike along seven modern walking trails. Come to Ross Farm Museum to explore 60 acres of rolling farmland and discover what life was like on a Nova Scotia family farm over 100 years ago. An authentic, living heritage site, much of the farm remains the same as it was in the 1800s. From historic Rose Bank Cottage where the Ross family lived, to daily activities such as wool spinning, candle making, and ox shoeing, the museum gives visitors the chance to experience yesterday’s traditional farming methods, while learning sustainable ways of living for today. Chat with costumed interpreters, hike the scenic nature trail, take a wagon ride or winter sleigh ride, and meet the animals who live and work on the farm as you connect with Nova Scotia’s rural heritage. Whether you’re milking a cow or enjoying the site’s natural beauty, Ross Farm Museum provides a unique glimpse of life in the 19th-century. Come and explore life at sea, up-close and personal at the Fisheries Museum of the Atlantic in the UNESCO World Heritage Town of Lunenburg. Learn about Rum Running, whales and August Gales. Meet lobsters, flounders, cods and more in our aquarium. Have a yarn with old salts and enjoy Bluenose memorabilia. Walk the docks, visit our wharf-side vessels and refresh in the salt air as you take in one of the best maritime moments in the world. Visit the Salt Store Gift Shop or dine at the Old Fish Factory Restaurant. Come rain or shine and discover something for all ages in one of Nova Scotia’s most celebrated fishing communities! From 1860 to 1968, this water-powered mill lightened the workload for Nova Scotian farm families by carding a week’s worth of wool in one hour! See the very machine that revolutionized carding in the area and imagine the clatter as it prepared wool for bedding and spinning. Step outside and picture the line of ox carts that would wait patiently as women operators processed loads of sheep fleece. Travel back to 1780s Nova Scotia and the recently settled townof Shelburne. Here, thousands of Loyalist refugees began new lives after the American War of Independence. In this historic store, seasoned merchants George and Robert Ross carried on an international trade in tea, coffee, rum, port and wine, while offering both necessities and luxuries to the town’s residents. Greet the clerk and step up to the counter stocked with the kind of goods the Ross Brothers once bartered and sold. Spend some time inside their living quarters, furnished in the sparse but elegant style of the period, and visit the Militia Room above the shop where you might meet a 1780s militia guard. Step into this authentic harbour-side dory factory to discover the historic Shelburne Dory and enter the world of the famous Grand Banks fishery as it existed from 1880 to 1971. Learn how Shelburne dorymakers rivaled their Lunenburg competitors by using the dory clip. Find out why the reliable dory was the backbone of the east coast fishery and the most popular small craft in the Atlantic Provinces for almost a century. Discover how this busy, local industry of the late 1800s saved Nova Scotian women endless hours of washing, spinning and weaving their wool at home. See the machinery that transformed raw fleece into yarn and cloth and listen to stories about the lives of the mill workers. Imagine the steady rhythms of the spinner, twister, skeiner and loom that were once powered by the river’s rushing water. Spinners are always welcome and schools are invited to call to reserve space for September visits. Among the oldest in North America, this meeting house was a building-in-progress for its first hundred years. Built by Congregationalist fishermen and farmers from Cape Cod, called Planters, the windows, doors, box pews, and a pulpit were added by the mid-1800s. People have gathered in this building for both township business and religious worship for two centuries. Inside, see period “graffiti” and listen to the resounding acoustics as you read a historic sermon. Outside, on gravestones in the cemetery, discover the stories of some early settlers. Founded in 1653 by Sieur Philippe Mius-d’Entremont, this remarkable community showcases the industrious and joyful spirit of the Acadian people, celebrating a language and culture that has thrived for more than 350 years. Learn the village’s history, hear Acadian spoken, experience fishing and farming traditions, explore historic wooden homes and buildings, savour home-cooked Acadian cuisine and enjoy hospitality that is second to none. Imagine the clang of the fire bell, the smell of smoke and the feel of hot steam as firefighters of the past raced to save burning homes in Yarmouth and communities across Nova Scotia. 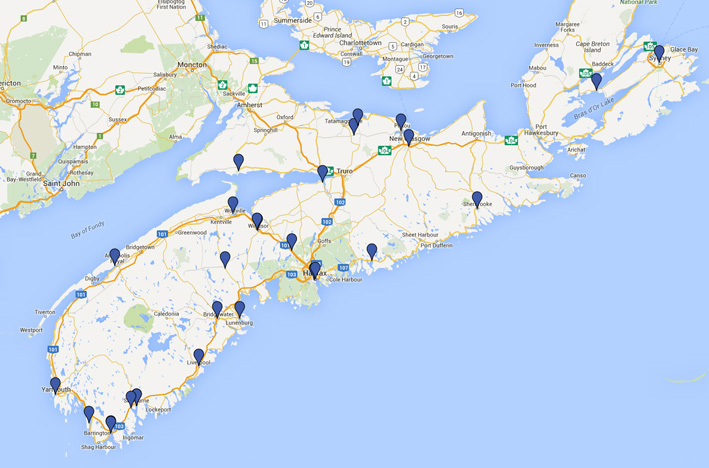 See types of fire engines used in Nova Scotia from the 1800s to the 1930s. Marvel at antique hand-drawn and operated engines such as Canada’s oldest horse-drawn steam engine, an 1863 Amoskeag Steamer. Take the wheel of a 1933 Chev Bickle pumper as you discover the history of firefighting in this province. Built around 1764, the exterior of this small farmhouse looks like a typical country home, but inside it boasts a collection of fine art and furnishings that create an air of Georgian elegance. In 1964, Robert Patterson bought this house and made it a showplace for his collection of antiques, including oak, mahogany and walnut furniture, and English porcelain. Be charmed by the history and culture found in this unique home, in the heart of one of North America’s most historic regions. Wind your way up the tree-lined drive to visit the home of Nova Scotian author Thomas Chandler Haliburton, who lived in this stylish residence from 1837-1856. Imagine Victorian Windsor as you explore the twists and turns of this house, where Haliburton created his claim to international fame: the fictional Yankee clock pedlar, Sam Slick. Tour the house to see antiques and memorabilia or walk the old estate featuring an orchard, pond, and trail. The Windsor Hockey Heritage Centre has temporarily moved to the Haliburton House Museum and its refreshed exhibit is ready for viewing. Imagine life in this Queen Anne-style house as you discover the Shand family legacy. Featuring an original indoor bathroom, central heating and stylish furniture from the Windsor Furniture Factory, this ornate house was considered a modern marvel when it was built for newlyweds Clifford and Henrie in 1890. Take the servant’s stairs to the upper floor and climb the tower for a magnificent view of the Avon River and countryside, a beautiful setting for this comfortable family home. In 1874, William D. Lawrence secured his place in marine history by constructing the largest wooden-hulled, fully-rigged ship ever built in Canada. An ardent believer in Nova Scotia’s 19th-century maritime power, Lawrence highlighted the critical role played by the shipbuilding industry in this province. Come visit his bright Victorian home and enjoy photographs, exhibits and tours that feature Lawrence’s era of shipbuilding, as well as tales of the Golden Age of Sail in Maitland. Come and explore Nova Scotia’s ancient world near the Bay of Fundy, where the world’s highest tides erode the towering sea cliffs to reveal evidence of 350 million-year-old fossils and local minerals, including amethyst and agate gem stones. Discover these Jurassic and Triassic landscapes where Canada’s oldest dinosaurs once roamed and learn about the animals that lived in their shadows. Visit the Fundy Geological Museum to unearth this province’s rich geological past! Come discover Balmoral Grist Mill Museum; a three-storey mill with an overshot waterwheel, tucked away in a wooded gorge on Matheson’s Brook. See the mill in action, just as it would have been when Alexander McKay opened it in 1874. Hear the whir of wooden gears as shafts and pulleys turn the original Scottish granite millstones. Watch as grains are ground, sifted and turned into flour. Sample the flavour of oats toasted on the cast iron floor of the kiln. Treat yourself to the experience of a waterside grist mill from Nova Scotia’s past. Explore this 1894 saw mill and discover Nova Scotian ingenuity in a mill once powered by steam. For nearly 70 years, Alexander Sutherland and his family produced carriages, sleds, windows, and fancy gingerbread trim, which were shipped on the old railway line beside the mill. Today that line transports cyclists and other recreationists as part of the Trans-Canada Trail System. See many examples of the Sutherlands’ resourcefulness throughout the mill. Rain barrels on the roof provided fire protection, a copper bathtub was used for soaking shingles and a recycled cream separator was converted into a band-saw. See demonstrations of how power was transferred through belts and pulleys, while enjoying hands-on exhibits. Scotia” than the Museum of Industry! Dr. Thomas McCulloch, came ashore in 1803 and soon found himself leading a monumental change in the lives of 19th century Nova Scotians. Visit McCulloch’s 200-year-old brick home and explore exhibits that detail how one man’s passion launched him on a journey to create public education in this province. Experience Nova Scotia’s Gaelic culture, heritage and hospitality at this living history museum and folk-life centre in scenic Iona, located in the heart of Cape Breton and overlooking the magnificent Barramens Strait on the Bras d’Or Lakes. Take part in a traditional céilidh, hear Gaelic singing, learn to speak Gaelic phrases, and become captivated by the spirit of pioneering Scottish Gaels. See costumed animators demonstrate skills such as weaving, quilting and rug hooking. Explore the beautiful rural setting that features a Hebrideanstyle blackhouse, a 19th-century wooden church, period farmhouses, and rare farm animals such as Soay sheep and Highland cattle. Visit this historic home to discover how a controversial Loyalist Anglican minister and his wife started a new life in the capital of a rapidly growing British colony. Get to know Rev. Ranna Cossit and his wife, Thankful, who raised their family of ten children in this modest New England-style house. Chat with costumed guides and take part in daily activities of the 1700s, like stitching a sampler or churning butter. Come explore what may be the oldest house in Sydney. In the 1860s, timber, tall ships and gold brought prosperity to Sherbrooke’s people. Today, you can explore this amazing village with its 25 original buildings, to experience life as it was along the St. Mary’s River before the 1900s. Hear tales about the village as costumed interpreters bring history to life. Watch sparks fly as the blacksmith’s hammer hits the anvil, see the weaver’s nimble hands at the loom and hitch a ride in a horse-drawn wagon. From the crackle of wood burning in the cook stove, to the smell of the saltwater breeze, come experience the warmth and welcome of Nova Scotia’s Eastern Shore in a fishing family’s home. Built in the early 1900s, this house once belonged to Ervin Myers, his wife Ethelda and their 13 daughters. Like many other families who resided along Nova Scotia’s shores, the Myers’ made their living off both the land and sea, fishing throughout the summer and working the woods in the winter. Step into this charming home or take a stroll around the grounds to discover how extraordinary ordinary life used to be.